The museum shows you how jenang was made a long time ago traditionally. It was a lengthy and energy-consuming task. Imagine rowing gently for hours. That’s perhaps what it felt like. Jenang is dark-colored sticky snack primarily made of flour and palm sugar. Though it resembles ‘dodol’ that you may discover in some other areas in Java (such as Garut, West Java), jenang is only discoverable in Kudus, Central Java. And the town happens to be my place of origin. To understand how jenang became the food that we all know now, we need to know its origin. Legend has it that jenang kudus is believed to be closely related with a village named Kaliputu, located in the heart of the regency. 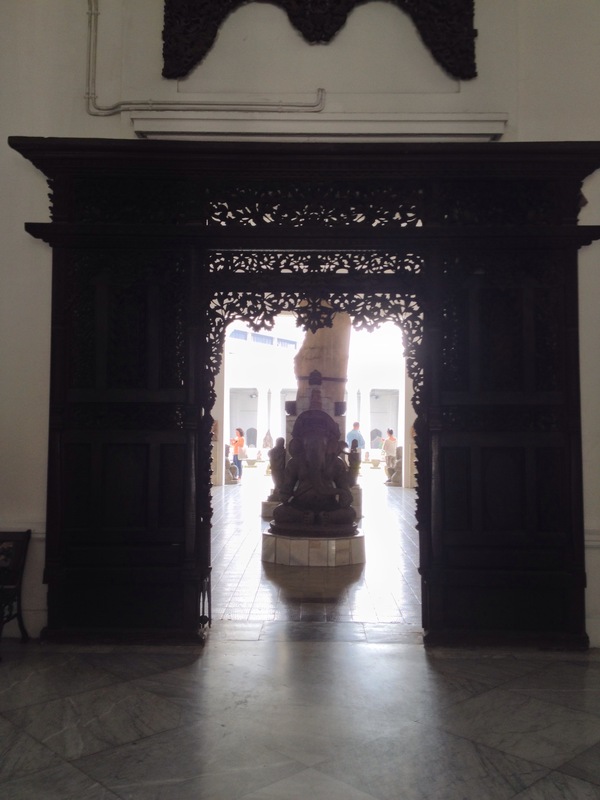 It happened when Sunan Kudus (a local religious leader born centuries ago in the advent of Islam in the Hinduism-and Buddhism-dominated Java) and Syekh Jangkung (also known as Saridin) and Mbah Depok Soponyono and his grandchild began a journey. In the course of it, Mbah Depok Soponyono along with his grandchild was playing with doves by a riverbank. Without warning, his grandchild fell into the river and got drowned in an instant. The child was at last rescued by a number of people living around the scene. Upon learning this, Sunan Kudus and Syekh Jangkung rushed to the riverbank where the people gathered and turned desperate as they found the body. They panicked and could do nothing about it. Sunan Kudus drew a conclusion that the child already lost his life. But Syekh Jangkung stated that Soponyono’s grandchild was actually still alive. The thing was he only died temporarily. And to wake him up, Syekh Jangkung was asked to cook ‘jenang bubur gamping’ (roughly translated to ‘calcite porridge jenang’) so he coud feed the poor child. The porridge was called so as it was made of rice flour, salt and coconut milk (all of these ingredients are naturally white in color). And then Sunan Kudus remarked,”Suk nek ono rejaning jaman wong Kaliputu uripe seko jenang.” It meant:”One day all these people living in Kaliputu village will be earning a living from making jenang. This story was orally passed on from generation to generation and definitely hard to find its validity as there was no historic record stating so. As an expression of gratitude, every the first of Muharram (i.e. the Islamic New Year), Kaliputunese natives hold Kirab Tebokan or a parade dubbed ‘Arak-arakan Jenang’. If you’re curious as to how this story went on in the modern 20th century (whether or not these people really make a living by making jenang), Jenang Museum on Jalan Sunan Muria (Sunan Muria Street), Kudus, is the place to go to. It was founded by the third generation of a family having been running the most renowned jenang business for almost a century in Kudus. The first generation of it lasted from 1910 to 1940. The couple was H. Mabruri (H means Haji, assigned to a man after completing a pilgrimage to the Holy Land) and Hj. Alawiyah (Hj means Hajjah, a Haji for a woman). They passed the business on H. A. Shochib and Hj. Istifaiyah. The second generation was running the business for 52 years (1940-1992). Afterwards, the third generation took over in 1992. Currently H. Muhammad Helmy and Hj. Nujumullaily are responsible for the entire business operations. As I went into the museum (which was located on the second floor of a building), I found the place was filled with quite numerous photographs printed on – I assumed – sheets of cloth. They were probably reproduced digitally so as to cut the costs. There’s much room for improvement in the way these vintage photos are showcased in fact. Because people don’t want to just see and then nod and leave without impression. They need contexts behind each photo presented. What makes it important for them to know this? And most importantly, why should they appreciate the past more than before? Most of the photos showing public facilities and places in Kudus during the Dutch Colonial Era are showcased with labels. But to me (and even my father who was born in the early 1950s), the labels do not help us to understand the historical context behind each photo. The artefacts surely have a purpose to be there, and I couldn’t fathom the reason why they are all there except they are there to be create the atmosphere that a museum should have: antique, old, and historic. Whoever designed the museum forget building the ties so visitors at any ages could more easily relate themselves to the photos. So when I was there to sightsee, I failed to find something insightful for me to bring home and kept for the rest of my life. The artefacts are so detached from their context that visitors like myself had no opportunities to comprehend the reason why this or that matters to me, to understand who I really am as a human being. Hence, the museum succeeded in its attempt at building bridges for us to understand why jenang still exists now, has claimed its unique place as a signature food of the town and how Jenang 33 (the brand the family has built for decades) has stood out among other jenang brands in the regency. We can learn the lineage of the family from three generations. But aside from that, there is nothing I could find or discover. The photos of old public places and vital objects in Kudus they exhibit served nothing more than decoration to impress. So if I had had the authority to change the name of museum, I would have renamed it into “Museum Jenang 33”. My reason is that the museum seemed to contain more information and background of the jenang brand and business and the people responsible for its glory. But even if I renamed it after all, the name would not fit perfectly as there is a higher number of photo collection not related to jenang or jenang making or jenang history at all. Take the brief bio of Raden Mas Panji Sosrokartono and Ngasirah (the biological mother of Raden Ajeng Kartini – the women emancipation hero in the country) as some examples. They don’t seem to fit in the collection because both were no jenang makers, or very likely to have contributed nothing to the jenang industry. Or if there were any contributions or ties, there was no slightest mention of them. There are also many other photos such one showing the town square in 1936 (without mentioning any historical background to accompany the photo as to why people in the photo behaved the different way from one of people in Kudus these days), a family photograph of the family of Raden Mas Tumenggung Tjondronegoro (also known as Poerwolelono, who was also a travel writer whose writing was in Dutch and published in mass media) dated 1867, etc. There are also photos of some vital objects in the town, for instance one of the central police station dated 1928 (a few Dutch key officers were also in sight, with the majority of police officers were of course locals), one of a public theater taken in 1929, one of Kudus Main Train Station taken in 1936. Despite my criticism, I truly like the place as it serves as a good point to start learning the history of jenang and the town itself. As far as I’m concerned, visiting a museum has hardly ever been a pleasure for locals. There is a subtle assumption that museums are built and opened and thus must be visited only by either school-aged children or tourists. There is no logical reason why a local should be there except for making money from tourists’ visits. But if I really am allowed to provide recommendations of betterment of the museum, I’d say they must prepare people (recruited as curators or guides to stand by at the museum) with deep and broad understanding of the history of jenang, meaning it includes not only the history of the brand and family history but also how it was usually made in the past, what utensils were required and how jenang was made back then, and we may go forward to the current progress when modern industrialism came and was adopted, enabling jenang to be produced by machines and wrapped in plastic and shiny, neat dark paper boxes, in various novel tastes and flavors no one had never imagined before. With the presence of guides or curators to tell people stories (contexts) behind whatever is shown there, the museum is going to be one of the vital centers of history learning. That said, people know more about the roots, the society they are living in with all the norms and traditions and beliefs and customs. Bila ingin melihat kompleksitas budaya dan pemikiran sebuah masyarakat, amatilah produk fisiknya. Begitulah yang terlintas saat mencermati gebyok atau ukiran gerbang depan rumah khas Kudus. Ukirannya berbeda dari daerah-daerah lain karena lebih rumit dan sulit dibuat. Karenanya, harganya relatif lebih mahal. Sebagai warga asli Kudus, saya seperti memanggul kewajiban untuk menjelaskan bahwa kekayaan budaya lokal ini semestinya diketahui oleh lebih banyak orang, seperti Anda. Berikut saya rangkumkan 10 fakta menarik tentang ukiran khas Kudus. Semoga menambah wawasan Anda. Meskipun Kudus terlihat relatif homogen, pada realitanya dahulu kala ia diperkaya dengan beberapa budaya yaitu Eropa, Tiongkok, Hindu dan Islam. Di masyarakat Kudus kontemporer, kebudayaan Hindu sudah jauh pudar. Sangat jarang ditemukan orang Kudus dengan kepercayaan satu ini. Saya kerap melewati satu ruas jalan bernama Kyai Telingsing. Nama yang amat aneh untuk telinga Jawa saya. Usut punya usut, ternyata nama jalan tadi diambil dari nama seorang warga Tiongkok yang menetap di Kudus pada sekitar abad ke-15. The Ling Sing, begitu namanya, memiliki pengetahuan Islam yang baik sehingga pantas disebut sebagai ulama. Begitu ia berada di Kudus, The Ling Sing mulai mengembangkan bakatnya dalam seni ukir. Konon, ia mempraktikkan aliran seni ukir Sun Ging yang terkenal karena halus dan indahnya. Nama Sun Ging ini pun kemudian diadopsi menjadi sebuah nama desa di Kudus; Sunggingan. Sang kyai Tiongkok itu kemudian menyebarkan pengetahuan agamanya dengan membuka perguruan, atau pesantren. Karena itu, jangan heran kalau beberapa orang yang mengaku asli Kudus dan beragama Islam serta bermukim di dekat Menara Kudus memiliki penampilan fisik yang mirip orang Tiongkok. Rambut mereka kejur, mata mereka cenderung kecil dan sipit, dengan kulit kuning bersih. Beberapa teman dan kenalan saya ada yang demikian dan saya akhirnya memahami bahwa mungkin mereka memiliki sisa-sisa gen The Ling Sing. Fakta 3: Ukiran Kudus berfokus pada rumah.Berbeda dari ukiran Jepara yang lebih banyak dipakai dalam perabotan rumah (almari, kursi dan meja misalnya)‎, ukiran‎ Kudus memfokuskan diri pada rumah. Ukirannya menunjukkan kehalusan dan keindahan. Bila diamati cermat, bunganya kecil-kecil dan bisa 2 atau 3 dimensi. Fakta 4: Motif ukiran Kudus ada 4.
di atas pintu masuk ke gedongan. Fakta 5: Ukiran Kudus makin langka dipakai di rumah penduduk asli. Rumah seorang teman SD saya pernah memakai gebyok ukiran khas Kudus tetapi beberapa tahun lalu sudah diganti dengan gaya modern. Satu hal yang memprihatinkan adalah ukiran ini makin jarang ditemui di rumah-rumah warga Kudus sendiri. Kebanyakan gebyok Kudus malah dipakai di museum, di tempat-tempat umum seperti hotel, restoran dan sejenisnya yang ingin menarik pengunjung dengan nuansa etnis. Jika Anda berkunjung ke Kudus, jangan lewatkan warung soto satu ini. Di Kudus, jarang dijumpai makanan dan olahan daging dari sapi. Semuanya berasal dari daging ayam, daging kerbau atau daging bebek (kami menyebutnya mentok), atau sebagian lainnya yang Anda tidak pernah terpikir, seperti seluruh tubuh burung puyuh mungil yang malang. Mengapa orang Kudus tidak dibiasakan mengkonsumsi daging sapi? Konon, dahulu kala sebelum Islam masuk ke daerah ini, lebih banyak pemeluk agama Hindu yang tinggal di Kudus. Itulah mengapa Anda bisa menemukan sebuah masjid dengan menara yang mirip candi di sebelah warung soto yang fotonya saya unggah di sini. Masjid dengan menara itu kami sebut “Masjid Menara Kudus“, tetapi penduduk lokal cukup menyebutnya “Menoro”. Dan seperti kita ketahui, ajaran agama Hindu meyakini sapi itu binatang suci. Sapi merupakan simbol kekayaan, kekuatan, kelimpahan, semangat memberi yang tulus, dan kehidupan yang makmur dan lengkap dalam bumi (sumber:Wikipedia). Karena itulah, para pemeluk Hindu terutama di Nepal dan sejumlah negara bagian di India mengharamkan mengkonsumsi daging sapi dan olahannya. Sapi disucikan bisa jadi karena mereka adalah hewan ternak yang hasilnya bisa menghidupi manusia. Dari susu dan tenaganya bisa dimanfaatkan untuk memberi makan dan membantu manusia mengolah dan kotoran mereka menyuburkan tanah pertanian. Bahkan menurut Mahatma Gandhi, keyakinan bahwa sapi adalah binatang suci dan tidak boleh dikorbankan ialah ajaran inti Hindu (sumber: Wikipedia). Namun, seiring dengan makin berkurangnya penganut Hindu di Kudus, tradisi dan keyakinan yang menganggap suci sapi memang makin lama makin pudar tetapi toh tidak sepenuhnya hilang. Sebenarnya cukup banyak warung soto kerbau yang ada di Kudus. Ada soto kerbau (dan ayam) di “Soto Pak Denuh” yang berada di jalan Jepara dan Agil Kusumadya (jalan provinsi ke arah Semarang), warung soto “Karso Karsi” yang ada juga di jalan Agil Kusumadya, tetapi warung soto satu ini unik karena bangunannya yang amat sangat lusuh. Dari dulu sampai sekarang, tidak ada perbaikan mencolok di sana. Sejak saya kecil sampai terakhir berkunjung di sana Lebaran tahun ini, tata ruang warungnya masih sama, dindingnya masih persis. Kuno dan entahlah, vintage mungkin? Namun, saya pikir tidak semua tempat harus terus menerus diperbarui agar tampak segar. Beberapa tempat lebih cocok jika dibiarkan begitu saja apa adanya karena kelak di sinilah kita akan berkunjung sesekali untuk bisa mengenang memori-memori di masa lalu. Dan bagi saya, mengunjungi warung ini bukan hanya memesan dan makan soto kerbau saja tetapi juga menikmati rasa dan ingatan lama. Soto kerbau dan jeruk hangat yang akan mengurangi efek negatif lemak. Kombinasi yang unik kan? Bayangkan perut Anda panci yang baru dipakai membuat sup daging. Untuk mencucinya hingga bersih lagi, Anda akan gunakan jeruk nipis itu mengangkat lemaknya. Saya sering diolok-olok bahwa orang Kudus, terutama Kudus Kulon (Kudus bagian barat sungai Gelis yang membelah kota), adalah orang-orang yang kikir. Warung ini kebetulan juga berada di sisi barat sungai itu. Anda bisa lihat ukuran mangkuk soto Kudus memang unik karena ukurannya yang mungil. Satu porsi soto kerbau ini harganya termasuk mahal untuk ukuran orang lokal. Dengan bakso sekitar Rp5-6 ribu per porsi dengan ukuran yang mengenyangkan, porsi soto kerbau ini hanya terasa separuh kenyang. Tanggung, begitu kata orang yang suka makan banyak. 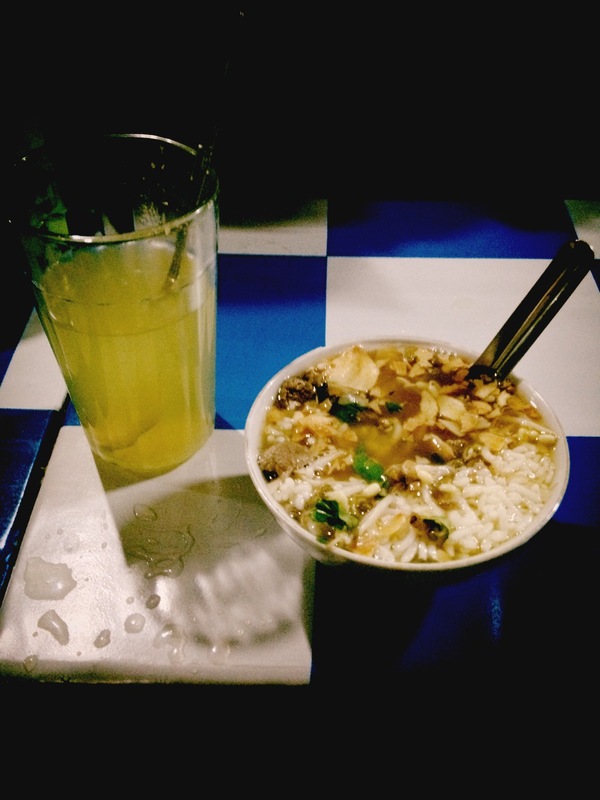 Soto kerbau di warung ini harganya Rp8.000. Bukan harga yang mengeruk kantung bagi turis ibukota tentunya yang sudah biasa makan di mall dengan harga per sajian yang rata-rata Rp50.000. Bersama dengan hidangan itu, Anda bisa mencoba krupuk paru. Dan satu rekomendasi lainnya adalah mencicipi krupuk rambaknya yang khas. 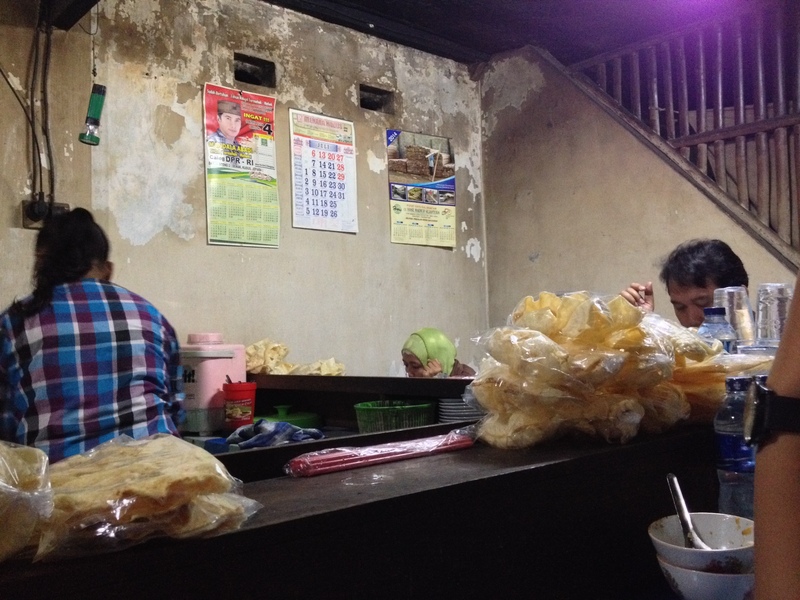 Krupuk ini terbuat dari kulit. Kulit hewan ternak apa, saya tidak tahu persisnya. Tetapi intinya keduanya sangat amat gurih. Cocok untuk mereka penggemar makanan ringan yang membangkitkan selera makan. Penjualnya ada dua wanita paruh baya. Mereka bersaudara, jadi tidak heran muka dan perawakan badan pun sangat mirip. Pembeli harus bersabar karena pelayannya hanya 2 orang! 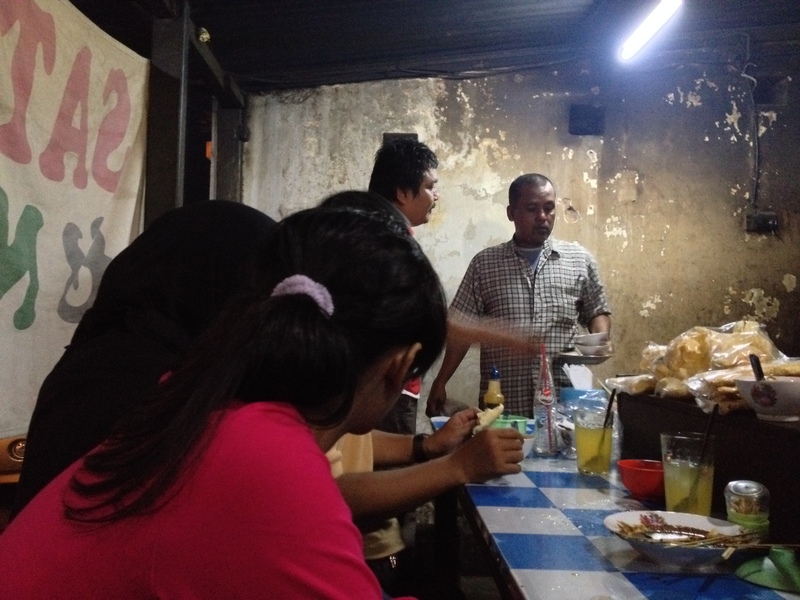 Terbatasnya sumber daya membuat warung ini kurang cepat melayani konsumen. Saat saya meminta tambah 1 mangkok lagi, misalnya, ibu itu tampak sibuk dengan ponsel. Ia mengurus pesanan makanan dari pelanggan setia yang tidak datang tetapi sudah mengubunginya untuk dikirimi makanan. Apalagi saat itu baru Lebaran, saat orang-orang bisa lupa daratan dengan makanan. Karena itu, pesanan saya terlupakan dan saya harus mengulang lagi permintaan saya padanya. Perempuan itu pontang-panting bersama saudaranya melayani pembeli warungnya, lalu menyiapkan makanan untuk dibungkus lalu dikirim ke sana. Mukanya sangat familiar. Ia mungkin pemilik sekaligus pelayan utama di sini. Kalau dalam pembahasan entrepreneurship, saya jadi teringat dengan kata-kata Sandiaga Uno tentang scaling-up. Saya pikir perempuan-perempuan ini adalah pebisnis yang ulet dan tangguh. Buktinya mereka sudah bertahan selama puluhan tahun. Dan mustahil mereka tidak menikmati untung besar dari sini karena jika bisnis soto kerbau dan sate kerbau ini cuma untung sedikit, kenapa mereka harus repot-repot bertahan sampai selama itu? Mereka bisa saja mencoba bidang bisnis lain. Bisa jadi karena mereka sudah memiliki kekhasan dan jati diri brand bisnis di sini. Orang Kudus yang mana yang tidak tahu lokasi Menara Kudus yang dianggap sebagai ikon kota kretek Kudus? Dan warung ini terletak tepat di sebelahnya. Sangat strategis dan tidak bisa terlupakan oleh mereka yang berkunjung dari luar kota, misalnya. Masalahnya mereka sudah berpuas diri. Tidak ada keinginan atau ambisi untuk membesarkan bisnis itu menjadi, katakanlah, sebuah waralaba yang tersebar ke seluruh Indonesia , bahkan dunia. Dindingnya sejak dulu begitu. Tidak makin putih. Tetap kelabu. Mungkin karena asap masakan. Tetapi kadang mindset tradisional dan konservatif seperti ini menjadikan UMKM seperti ini menjadi begitu otentik, begitu lokal, khas, tiada duanya. Pengalaman yang bisa dinikmati di sini tidak akan bisa ditemukan di tempat lain di dunia, tak peduli seberapa mewah dan bersihnya. Malah kalau tempat ini direnovasi, memori – hal yang paling disayang manusia – bisa terhapus. Untuk alasan tertentu, saya bersyukur kapitalisme tidak sampai menyentuh warung ini. Bila dinding warung soto kerbau itu menjadi bersih, rasanya pasti akan lain. Jika soto mereka itu kemudian diwaralabakan, cita rasanya mungkin akan berubah. Membakukan bahan baku dan cara memasak mungkin sukar tetapi yang lebih sukar lagi adalah bagaimana mempertahankan sensasi yang membuat orang bisa melayang dalam benak mereka cuma untuk bernostalgia ke masa lalu mereka saat masih kecil, masih muda. Warung ini bukanlah mesin waktu Doraemon yang bisa membuat pengunjungnya kembali ke masa lalu seenaknya tetapi setidaknya ada kepuasan tersendiri saat memasukinya. Semacam melankoli atau apalah. Sulit mendefinisikannya dengan kata dan logika. Karena ini berkaitan dengan RASA. What you see is supposed to be a dry bus terminal. The photo was uploaded by a friend of mine Thurday (23/1/2014). My hometown Kudus has been notorious recently after getting inundated for days. Access to the smallest town in Central Java is cut off (but as of today has been recovered, says some sources on social media) resulting in the draining supply of fossil fuel. The rainfall has also been decreasing, the sun was shining today, which makes cleaning-up easier. Kudus was literally inaccessible by land as the main road got flooded and bridges broke down. My uncle who works as a teacher in Pati couldn’t find the way to get home on Friday. The bus station was officially closed as the water flew in the nearby area. I never heard flood at this ‘amazing’ scale before though I knew some part of Kudus is prone to this annual ‘natural disaster’. But that’s what happened down there. People on the higher elevation suffered from another calamity: landslide. Proses pencarian warga yang tertimbun tanah longsor di Duku Kambangan, Desa Menawan, Kecamatan Gebog, Kudus, Jawa Tengah, masih terus dilakukan. Warga sekitar bersama tim Basarnas dan petugas gabungan menemukan dua korban lagi pada Minggu sore, 26 Januari 2014. Korban diketahui bernama Mursidi, 45, dan ibunya, Rukmi, 75. Keduanya tertimbun longsor sedalam tiga meter tepat di titik lokasi rumah mereka. Saat ditemukan, jasad Mursidi tengah memeluk ibunya yang masih mengenakan mukena. Posisi tersebut memperlihatkan bahwa korban berusaha melindungi sang ibunda dari reruntuhan. Usai dievakuasi, jenazah Mursidi dan Rukmi langsung dimakamkan di Pemakaman Dukuh oleh pihak keluarga. Sementara itu total sudah 11 korban yang berhasil ditemukan. Selain Mursidi dan Rukmi, korban tewas akibat tanah longsor di Kudus yang sudah ditemukan antara lain, Asrori, Umiyanti, Ulfa, Karmudji, Istiqomah, Sulasmi, Ismawati, M Iwan, Suwodo. The bottom line is someone died with his mother and he was found protecting his mother, while the elderly was praying. My father told me there was a colleague of his died, buried just all of a sudden also here. But I don’t know which one he meant. As mentioned by BBC Indonesia (25/1/2014), Kudus has been severely hit by the flood. Of 9 districts, there are 6 badly affected by the unusually heavy rainfall, causing almost 14,000 people to refuge and the number is on the rise still unless the weather gets warmer and drier. 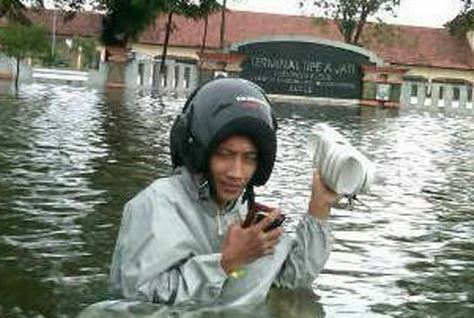 BBC Indonesia cited the weather forecast that Kudusand the neighboring towns will still have to be alert. The access is gradually normal. The height of flood around the bus terminal is much lower so it is safer for buses but not for motorbikes or sedans. It takes 3 hours and a half to get to Semarang from Kudus via Welahan, Jepara, the alternative route. But I live in Indonesia. This is one of the places on earth where you cannot rely solely and happily on the recording and documentation systems. Not to mention about the accuracy. We have no idea that the National Archive (Arsip Nasional) still holds papers like birth certificates, marriage documents, census records or whatever that showed precious information on how, and how and when my great great great grandparents with their offsprings lived their lives. Don’t get me wrong. It’s not like Indonesians hate their roots but we are more of an oral society by nature. Writing a journal, publish a book or posting on a blog like this means we one step ahead than our predecessors. You spread the words not only to people around you physically and emotionally but also people around the world. Maybe documenting our important life events is not one of our strongest genes but one can find stories of familial journey in the minds of the people. I find Indonesians mostly are great storytellers (well, most people are) but not many eventually pour their words into printed stuff for the next generation to read. Yet, knowing how our predecessors lived their lives is not a mere attempt at understanding our identity and origin (which in turn may humble us) but also understanding how the entire nation and the world of that era in general worked. So I can more easily relate myself to historical events, simply because I know some people living in that era were . Suddenly, the long history of my nation seems closer and more relevant to me because I have that strong connection. Knowing my family history proves to be helpful when I have to understand and make sense the history in a larger scale, both national and international. And boy, why should I care about the history in the text books every school student must read in the country? What I find there is a compilation of compromised pieces of so-called facts gathered and assembled by the winning parties, the corrupt rulers ready to distort anything at their advantage. Some cynically said the word “history” actually derives from two separate words: “his” and “story”, which is not necessarily an honest recount of facts or real events. Anyone (a story teller) can manipulate it, improvise as s/he wants to, emphasize this but conceal that, overstate that and understate this. There are abundant rooms for anyone’s creativity and imagination. But in family history, there is no or much less political influence. Families here, as far as I know, don’t really care about their family history (not even document or record that carefully) because of course even if one can manipulate it, what can s/he benefit from the distorted chronicles? Not much. In the process of writing, I need to really workd hard on understanding the explanation of my paternal grandmother. She hardly speaks Indonesian, and never ever learned English in her lifetime so the one and only language she employed is Javanese, which happens to be my mother tongue. Yet, as I have been growing older, Javanese has gotten less and less spoken around me because Indonesian (bahasa Indonesia) started taking place in academic and other formal contexts. Even English was first introduced to me when I was a sixth grader. I was happily embracing the foreign language just like a new toy. And it IS a toy to play with, linguistically speaking. I hoped to learn more by acquiring English, and I really did. I had always wanted to live outside my hometown, where almost my entire family reside. And English enabled me to do that. Reaching out something new. That is what I want: newness, novelty. I didn’t give stability a damn because it translates to boredom. I refused to embrace the teaching world in which the majority of my family members earn a living, partly because there is part of me saying:”You don’t have to follow them. Find your own path or you’ll be sorry for good!” So I did and thus far there has been no remorse in my life for listening to this voice in me. There are of course a price to pay but the excitement seems to be surmounting the ordeals. 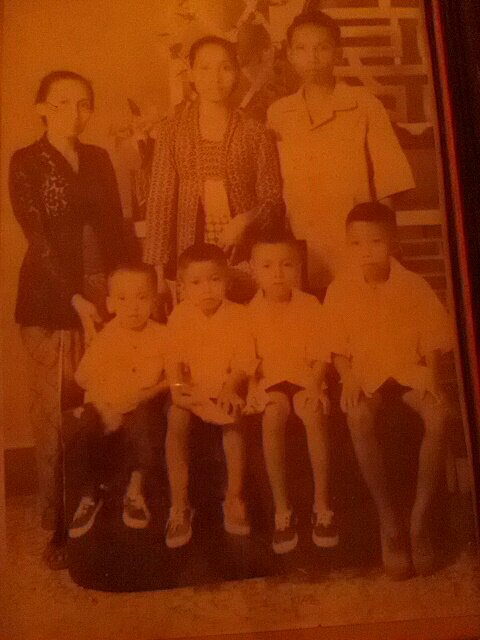 Muntianah, my paternal grandmother, had been raised as an orphan since her being an 8-month old fetus. Her mother (my paternal great grandmother) had died many years ago. I still recall her face and remember her funeral back then. There was no hollow feeling or great terrible loss sensation because I was too young to even think of and experience such painful emotion. I knew people mourned, wept, prayed for her peace up there but I just couldn’t make sense of the whole situation, like “She died. Oh, so what?” All I cared about was that I knew I could still watch my afternoon cartoon series on TV and eat foods I liked and went to school with all of my homework that day properly answered and being free from the fear of being grounded by the teacher. So that makes me help understand why the younger brother of my deceased cousin looked lively and act normally still even after he found out his eldest sister lost her life following a series of legs amputation procedures. He has his own world and the sister was apparently like a nice-looking gadget to his eyes; something cool to have but not his (almost) entire world. One day, young Muntianah was told by her mother to clean up the house in and out. In the meantime, the mother was doing her chore: preparing foods. Kudus, like other towns in Java during Japanese colonial era which only lasted a few yet very bloody years, experienced food scarcity. Muntianah knew first handedly people around her dying of extreme hunger. But that very day, the family was lucky enough to be able to find things to eat: waloh (pumpkin-like fruit) and kangkung (a type of green vegetable having thicker stalks than spinach). Young Muntianah was struck by a bundle of ‘treasure’ thrown away in the rubbish basket. She opened it and found that in it there was some garlic and onion. Definitely not something worth getting rid of! She shrieked at her mother who was still cooking. “What’s wrong?” my grand grand mother said to her daughter. She later found out Nyai had deliberately put all of them into the rubbish basket, only to test how much young Muntianah really cared about the entire household, even what was thrown into the rubbish basket. Nyai was really really stern when it came to household management. Young Muntianah had better clean all the floor of the house, refill the bath tub (in which one couldn’t soak him/herself like in what we have seen in the West), and make sure the house chores done very well or else she had to miss the breakfast. The breakfast was ento-ento. It went without saying that it wasn’t the best or most delicious food ever but that was what they could afford that time. The texture of ento-ento was not particularly pleasant to the tongue. As coarse as pebbles, only you could swallow that safely. As a good mother, Nyai also sometimes treated her daughter when she knew she still had enough money even that meant there was very little extra money she could spend. Off they went to “Menoro”, which was an area of Sunan Kudus’ cemetery (as it was told by the ancestors). Sunan Kudus is like a local saint here. Along with Sunan Muria (whose corpse was laid in Mount Muria, according to folklores). They were two of the 9 walis (Wali Songo) who helped spread the Islamic teachings around Java that used to be Hindu and Buddha-centric. Nyai was there to buy a serving of delicious home-made soup which was usually accompanied by rice. Young Muntianah jumped with joy. It was the word “rice” that made her act that way. Rice was a culinary luxury of the era. Japanese troops would choke any natives to death in case they caught one hiding or eating rice for themselves or their own family members. High quality rice was to be sent only to the Japanese. But Indonesians as we know didn’t accept that as it was. There were many methods devised to violate the rule. People could enjoy rice but only when there was no single Japanese soldier around. Nyai was happy to give what her daughter wanted but Young Muntiah was far than happy. She was disappointed upon knowing that gobet (I hardly know what this is but it is very likely that gobet is another pariah’s food) was the replacement of rice in her ‘extraordinarily nourishing’ menu. Young Muntianah was never ever a fan of school. In almost every occasion, she reminded the audience (well, you know, it is her descendants) of how awful the system of education of the time to her eyes. She held begrudge towards a highly disciplined male teacher wearing blangkon (Javanese male attire). “He (the teacher) was insanely inhumane. He made a student stand inside the school restroom all day long. The poor student couldn’t help telling his parents and everyone as soon as he was done from being grounded. Everyone dreaded such teacher,” she reminisced looking up to the house ceiling. It was still the same house she used to live with her mother decades past, only much bigger and taller. My father and uncles had helped her renovate the house. hi mr. akhlis… where do u live now? like to ask you where can I find a yoga trainer in Kudus? it’s even hard to find one in Semarang. any suggestion to do yoga? well. what’s the most important in doing it? i’ll check it out in you tube..
and enjoy being who you are. maybe your impefection is another form of perfection. Try another new perspective. and yeah, expectation is overrrated. our lives are much too messed up and disoriented because of expectations, from ourselves, parents, social circles,society. some people think yoga is not for moslems, but I found some universal positive values there and why not? any idea to do it? well, okay… my house doesn’t look appropriate to do yoga. mess, crowded, noisy. what should I consider to choose the place? ouh… make sense. when silent! Try ester eckhart’s yoga videos. Great and informative for beginners who want to give yoga a try..
u can download the youtube videos on ixconverter.com. convert them into 3gp format and save them on the phone or PC so u can play them to guide you in practice..
really thanks, mr… I’ll try it. good evening, sir… Doing yoga in a high stress is so difficult recently. yes. but I didn’t succeed. bad emotion is dominant. How should i do? can we cry in yoga? if u feel like u want to,why not? Doing yoga is not always about always thinking positively or thinking good things al the time. It is not possible because life is not only a collection of positive things. So just let it go..
is it okay to say “I don’t care” in every single frustration? Maybe…haha…but let’s say “it can happen to me but it should strengthen me instead of bringing me down”. I think the I-don’t-care attitude will worsen and intensify complicated situations in the long run. So maybe we just have to hit the bull’s eye, find the root of the problem and simplify the problem. As recent as last Sunday..I finally got this ticket in my hand. It was costly enough but who cares. I’m not booking me an airplane. I love buses. Yes,call me archaic,but this transportation mode saves me lots of money. Never mind the pain of sitting 16 hours straight….I won’t complain. This picture was taken right in front of the agent office. 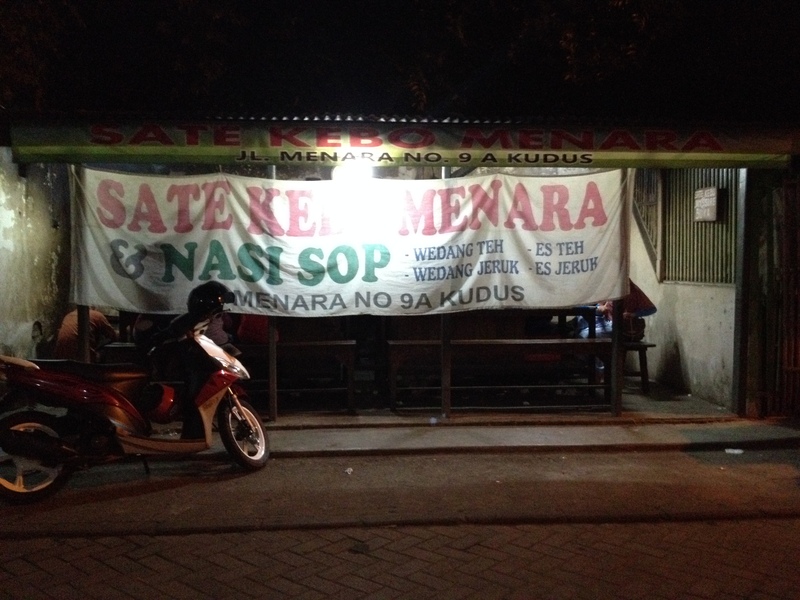 Because the bus agent is from Kudus, somehow there I found a restaurant selling soto Kudus, a culinary delicacy, next to it. You might notice the same identical design of the high rise in front elsewhere (to me it reminds me of Ciputra Mall in Semarang) other than Daan Mogot, West Jakarta. 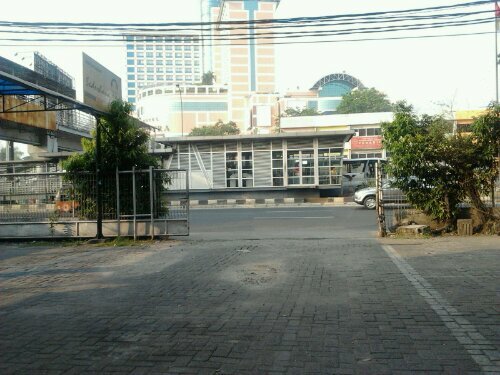 But that’s Ciputra Hotel strategically located around the intersection of Grogol. I arrived around 7.15 am, got the ticket about 1,5 hours after that, and quickly went home before the sun dehydrated me further. In the afternoon, I skipped my yoga class. Felt a bit guilty afterwards, especially as I felt unwell. Ugh, even my body screams for yoga!